Darrell Glenn was the son of singer / songwriter Artie Glenn. In fact, Artie wrote his son's first hit record that was also a hit for several others over the years - "Cryting In The Chapel". Artie's group, the Rhythm Riders provided the instrumental backup to Darrell's recording of this song, released on the VAlley Records label outof Knoxville. 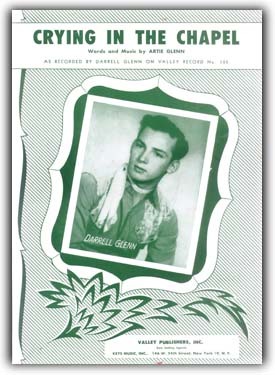 In 1953, Darrell was a regular on the Bewley Barn Dance, which was aired over WBAP-TV in Fort Worth, Texas every Friday night. He and his dad, Artie Glenn and the Rhythm Riders were also appearing on on the "...king-size hillbilly show" the Hayloft Jamboree held in the Northside Coliseum in Forth Worth. The Rhythm Riders were the house band for the show. 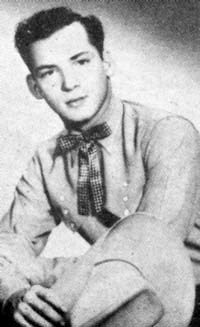 This busy talent was also appearing on the Big D Jamboree show that originated in Dallas and aired nationwide over the radio networks. As sometimes happens - a hit song or talent isn't initially recognized, Darrell signed up with Valley Records when a national publishing house didn't think he was old enough nor the song good enough at the time. But Jack Comer and Dave Garrison, who were partners at Valley Records saw something and signed up both Artie and Darrell Glenn. The song, "Crying In The Chapel" was released and an immediate hit. Darrell's record on the seemingly small label reportedly sold over 15,000 copies in two months. Suddenly, the national publishing houses were interested, thirteen of them came calling per one article in 1953. He got the attention of the national record labels, too. But for the time being stuck with Valley Records. All of that happened before he was out of high school. Before he graduated in June of 1953, he hadn't set foot outside of Texas. But after graduation, he hit the personal appearance trail on the coattails of his hit record, visiting nearly 20 states and Canada under the promotion of Valley Records. The song "Crying In The Chapel" has a personal meaning to the Glenn family, too. You see, there was a chapel was reference to a little church near the Glenn home where Darrell was often teaching Sunday School classes.